When you don't have kids (yet) like me, you tend to shower your affection and love on the next best thing and in my case, it's my three fluffy cats. So when Phoebe and Chubbster (Benji will turn 2 in March) celebrated their birthdays last month, we decided to indulge our kitties with a new cat scratcher as a birthday gift! After discount, this bright yellow scratcher was ours for RM280, which I thought was reasonable. All three cats were extremely curious when they saw B and me assembling their new playground. The moment we set it up, they came running out of their "condo" to come out and play. It's been a while since we got them any new toy to play with, so it was fun seeing them enjoy their gift. Perhaps now they will turn their attention and their claws to this scratcher rather than my sofa! Phoebe and Benji couldn't seem to get enough of the birthday gift. It was wonderful watching their silly antics on the scratcher. We were much entertained and ended up spending almost an hour engrossed watching them chase each other around and around. It looks like the cats are enjoying their new toy for now but I wonder how long this phase will last. They usually tire of a new toy quickly. 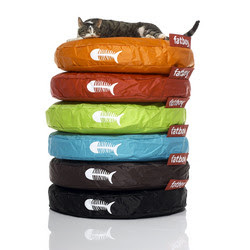 For their next birthday, I'm thinking of a modern-day cat bed like this Fatboy Catbag from Design Public. I'm sure Benji would purr with pleasure if he gets to nap on this funky yet comfy cat bed. As it is, he's usually the one conquering the best spot of the scratcher. If you fancy this cat bed or other cat related items, do check out some of the best pet products, coupons and deals offered by various merchants at Coupon Chief. Pay them a visit and if you come across any other cool cat beds like this one, do let me know! OMG! Eh where did you get it?? By the way, we have tagged u to a meme. Check it out! I wanna be a cat too!! Wow! Ur cats so spoil and pamper! I am amazed. Hahaha! Meow meow Aunty LJ! We love our b'day pressie from Master and B, now we have a new toy to climb and play hide and seek in. Yay, thanks Jesse! My kitties are purring happily to get a special b'day wish all the way from South Africa! We love Jesse the Cat! Hiya Phoebe, Benji and Chubbs... its Anja here.. Mommy showed me your birthday present.. and i absolutely love it lahh.. Wonder if mommy will buy me and my siblings one.. Hey Phoebe... your nose also very small like mine eh.. does your eyes water all the time??? Irritating kan?? Anyway... Happy Birthday to you guys and enjoy your pressie ya..
Anja and the rest of the 6 kiddies!! Haha...That's one cool playground! I really love that pic with Phoebe sitting on top! Aww how cute are they! Happy Birthday to them! How lucky they are to have a fun place to live and play. Hello Anja! I hope ur mommy gets you this scratcher or something even better! I bet you guys can't wait for something new to play with, or else, you can always come over and share ours! Hi Marzie!! What a cute little condo for your cats and I like the print with the little paws!! Your three little ones are really enjoying it aren't they!! Hey Marzie, Happy Birthday to all three of your cats. They sure lead a good life don't they? I wanna be GP's cat! Lol! What great contributions to wonderful kittens - and well documented with wonderful pics too - thanks for sharing! Meowww Purr Meow Aunt GP.. Mommy wants to get us this toy as well for me and my siblings... can you please let her know where you bought it and for how much..purrrrfeeectt please..
but thanks for the info.. i'll let mommy know...hehe.. meow meow Aunt GP! Thanks for the information.. I was showing Azwaj the picture.. and he loves it too.. so perhaps we'll check it soon..
Pet Zone ni.. a shop by itself ke.. in a shopping ctr?? sorry ah not familiar with it lahh..
All there are really cute and adorable. I never knew there are cool toys as such for kitties! i love the fatboy catbag! so cute! i haven't got the chance to pick up Kiki yet; got to buy his house first! Don't mind Aunty D ya! Here's some fish-shaped treats for all of you! I'm watching Summerland on YouTube now, wanna join me? It's a pretty cool show. There's beach, the ocean and a lot of sand! Thank you for the treat Aunty D, we love it MEOW! Hehehe sorry for flooding, GP! :):) Meow! Eeek! LOL flood away dearie, as it is TCM pun u dah terkeluar! Today Shemah and Bem Bem chit chat here la ha ha! Kiddoes, your buddy Mufasa is unwell. Aren't you guys gonna visit him? Master was moody, Pheebs? Did you give Master a big hug and ask her why she was moody? Aunty D! Visited him edi!!!! Oh no MCS at Cat tales????? Aunty D! I did but master was moody the whole day! Some more B went for Jom Heboh but don mention it at her other posts yeah? She doesn like ppl to know when B is away! Now also she looks moody Aunty D!! Debbs, kan they give u other opsis for the domain name? Then you can choose one nice one for CH, bila ni nak move? Tak sabar!!! MCS at Cat Tales izzit? Oh no! Dunno when la nak move, am not in a mood to tolerate anything technical ni lol!! TCM u dah keluar and TCO u dropped to 2 sweetie! I dunno cause I left comments edi earlier, hope they’re not missing! Master snuggled with Chubbs just now, we are all trying to make master smile and yes it is so hot today Aunty D! Some more we have our fur coats on, oh so hot! Lol you don't wanna lose your fur coat, do you Pheebs? Drink lotsa water and laze around on the cold tile floor ok? He he that’s what I’m doing now Aunty D, drinking and washing my face at the water fountain! Ohhhh well it’s only 10 bucks, so not that expensive. But buy ur stuff first of coz, biz first yeah? Oh so cute you washing face. Can't wait for your blog, Master said she'll record your Eeeekkk! Lol! !